Unique dual mode of action, Etoricoxib used to treat orthopedic and Thiocolchicoside used to control pain and swelling. Etoricoxib a selective cox-2 inhibitor decreases GI toxicity without effects on platelet function. 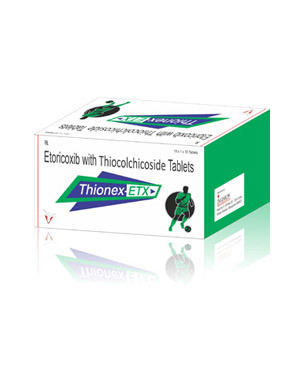 Thiocolchicoside a muscle relaxant possesses gabamimetic and glycergic actions. Shows significantly better relief compared with the modest improvement of inflammaton with each of the treatment alone. Etoricoxib shows advantages of convenient once daily administration and superior gastrointestinal tolerability compared with traditional NSAIDs. Thiocolchicoside is a preferred option for the lower back pain with muscle spasms. Etoricoxib provided sustained efficacy, as compared to naproxen. In OA patients treatment satisfaction significantly improved with Etoricoxib. Thiocolchicoside significantly improves the principal criterion by the second day and the other criteria within 5 days in low back pain.